On a bright Virginia spring morning, twelve men in pewter gray solemnly rode to the top of Clark's Mountain. From there, they gazed down on a virtual city sprawling below them for miles. They saw streets, huts, tents, wagons, horses, mountains of supplies, and thousands of men with gleaming bayonets. Confederate General Robert E. Lee turned to his loyal lieutenants and presciently announced "I think those people over there are going to make a move soon." Two days later, on May 4, 1864, that city of Union blue began to surge across the Rapidan River. For the next 40 days, it would relentlessly pummel Lee's Army of Northern Virginia in an unprecedented campaign of bloodshed and maneuver. Numerous books have covered the Overland Campaign, masterminded by newly appointed Union general-in-chief Ulysses S. Grant. Those who have read them may not find much new in Joseph Wheelan's account. But for those who haven't, this excellent one-volume account hits all the high points. In clear, concise, journalistic prose, filled with energetic verbs and colorful adjectives, Wheelan vividly recreates those critical days that permanently turned the tide of the war in the East. In addition, his rock-solid research and instructive anecdotes puts events and personalities into a context that brings clarity to the bloodiest spring of the war. Lee had fought in the 80 square miles of woods, thickets, and underbrush known as the Wilderness before. It was there that he achieved possibly his greatest victory, Chancellorsville. But Lee had never faced the relentless, unassuming, warrior from the West. James Longstreet had, however. Lee's most reliable lieutenant knew Grant personally and predicted "that man will fight us every day and every hour till the end of the war." Part of Grant's master plan would require the Army of the Potomac, still under the titular command of Major General George G. Meade, to do just that. Lee, ingenious and audacious himself, understood that the Confederacy was hanging on by a thread; he would have to oblige his bellicose foe or lose the war. Grant never intended to fight in the Wilderness. But by stopping early on the first day, Wheelan contends, Grant had "handed Lee a glittering opportunity to strike at the massive Union army while it was still inside the claustrophobic Wilderness, a place that nullified Meade's overwhelming advantages in numbers and artillery." The two armies stumbled upon each other on the Orange Plank Road, the Orange Turnpike, and forest waste in between. After three days of almost continuous carnage, the names of obscure country places like Parker's Store, the Wilderness Tavern, widow Tapp's house, Saunders Field, and the Chewning Farm would saturate newspapers stories, north and south, and Private Charles H. Wilson of the 18th Massachusetts would become the first name on dishearteningly long casualty lists. Both sides took a beating in the Wilderness, Grant worse than Lee. Wheelan's frequent use of eloquent and descriptive quotes from participants adds a terrible beauty to the almost indescribable chaos. "It was a wild and disconnected battling of regiment with regiment, of company with company, without plan, or purpose, or knowledge or result," wrote Norton Shepard of the 146th New York. J.M. Waddell of the 46th North Carolina wrote, "It was a mere slugging match in a dense thicket of small growth,""where men but a few yards apart fired through the brushwood for hours." Wheelan's own prose often approaches the melodic cadences of the antagonists. After the fighting on May 6 ended, he describes how "the veil of night fell away in tense silence to reveal a spring morning that might have been delightful but for the fuliginous air, the splintered trees, and the dead and wounded lying everywhere." When Grant pulled his forces back from the stalemated battle, his men thought it was to retreat back across the Rapidan to lick their wounds, just as they had done before. Lee knew better. He assumed Grant would do what he would have done, strike out for open country around Spotsylvania Court House. In the dark, Grant sat on his horse and watched as Fifth Corps turned south on the Brock Road, going exactly where Lee had predicted. Tired, dirty, and grievously bloodied, the men in blue nevertheless cheered wildly for their new commander's decision. But Lee got his exhausted army to Spotsylvania first. Now, the general whose first inclination was to attack, immediately began to entrench. Lee realized he faced a different kind of Union commander and different tactics would be needed to defeat him. "Lee's objective was now to seize the initiative somehow and strike Grant's army a mortal blow," Wheelan contends, "Grant's was to retain the initiative and keep applying pressure to Lee until his army crumbled to pieces." These character traits guaranteed that the bloody brawl would continue. Lee, a fortifications expert, "used the high ground his army occupied between the Po and Ni Rivers to bar the way to Spotsylvania and its web of roads pointing towards Richmond." According to Wheelan, "the Army of Northern Virginia blocked the Union's path with better fortifications than anything seen in the Wilderness, and its defenses were becoming more impregnable by the hour." Grant was determined to have at Lee but, with Sheridan and his troopers away running down Jeb Stuart and his horsemen, he was operating with virtually no intelligence. Wheelan concludes that this led Grant to misread the tactical situation and make several critical errors that dramatically raised the Union body count. Grant candidly admitted "We have had hard fighting today, and I am sorry to say we have not accomplished much." Attack and counterattack continued in the Spotsylvania area through May 19, a textbook example of Grant's strategy of attritional industrial warfare. The Overland Campaign was not meant to be conducted in a vacuum. Wheelan wisely includes complementary operations such as a thrust toward Richmond by the Army of the James under politically astute but militarily impaired General Benjamin Butler and Sheridan's cavalry operation toward Richmond. Neither action succeeded as planned although the irreplaceable Confederate cavalry "beau sabreur," Jeb Stuart, was killed by Union cavalry at Yellow Tavern on May 11. Checked at every turn, Grant finally decided to maneuver again. On the night of May 20, the army wheeled south and east. A shift in Union strategy now attempted to entice Lee to attack Grant. Lee wouldn't bite. 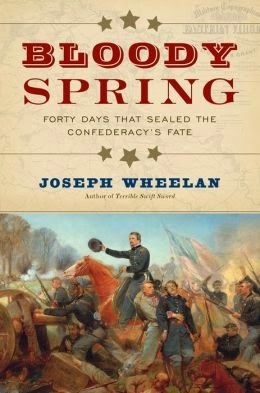 Wheelan's chapter on the often-overlooked May 23-26 confrontation on the North Anna River encapsulates his ability to succinctly summarize a campaign without losing the telling anecdotes that give life to events. It holds up well against longer accounts of that small, but potentially game-changing, action. The grisliest encounter, however, was still to come. After successfully withdrawing his army from positions opposite an entrenched enemy, always a risky gambit, Grant again sidled east and south, his movements masked by band music played far into the night. The next stop would be June 1 at Cold Harbor, a blot on Grant's reputation and henceforth to be likened to murder on the battlefield. Four and a half days of close-quarter's slaughter ended with a two-hour truce on the night of June 7 to collect the Union dead and wounded, almost 7,000 of them. In his Memoirs, Grant admitted "At Cold Harbor, no advantage whatever was gained to compensate for the heavy loss we sustained." But heavy losses never deterred Grant. After another four days of inconclusive but deadly trench warfare, the Army of the Potomac disappeared again, this time to emerge south of the James River in front of Petersburg. The Overland Campaign had become a siege operation. Grant's strategy of exhaustion, he maintained, had "so crippled [the enemy] as to make him ever after of taking the offensive." Wheelan's comprehensive monograph decisively describes how Grant accomplished his mission.